has a stronghold on my heart and it has for some time. Why? I am finally coming to terms with this but, really it’s quite scary. I’m finding out things about myself that I probably didn’t want to find out…I’ve repressed so much. Am I really angry or is this a mask for the fear that I feel? Scared that I’ll be rejected for who I am, scared that I won’t be loved, scared that who I am isn’t acceptable, scared that I will be abandoned. All this fear in my soul started at a very young age, I’m sure. I could go places with this that I really don’t want to, so I won’t. Who am I to blame any one person for this? It is, what it is. We are all sinners, we all have our fears and insecurities. This is who I am but who’s to say that the Lord can’t change my heart? That process is also frightening and a vulnerable place to be. I am angry that I am constantly being demanded of…I’m scared that I won’t be able to give what needs to be received. I am angry when I don’t get time to myself to be myself…I’m scared that who I am won’t be listened to or will be flat-out rejected. Lord, this place that I’m coming from is not a happy place…not right now. Help me to see that only You can truly change my heart, that You aren’t out to get me. Help me to see that You love me, cherish me just the way I am; that You won’t reject me; that You are always listening to me even when I’m not making much sense to myself. 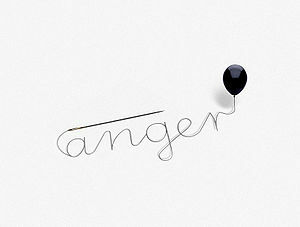 Help me with my anger, my fear and use these emotions to somehow better my relationships and further Your Kingdom. Categories: Confessions, Daily Bread | Tags: Anger, Fear, God, Jesus, Lord, Relationship | Permalink. Thank you for your honesty. It is an open door for God to pour out His grace and mercy into your life.